LAGASLAS is an activity of TAGA-ALOG, ILOG PASIG: BALIK TANAW, BALIK SIGLA! campaign by the National Commission for Culture and the Arts – a creative campaign for the promotion of Ilog Pasig as a space for cultural identity and collective memory. On this occasion, a children’s story writing workshop will be held. 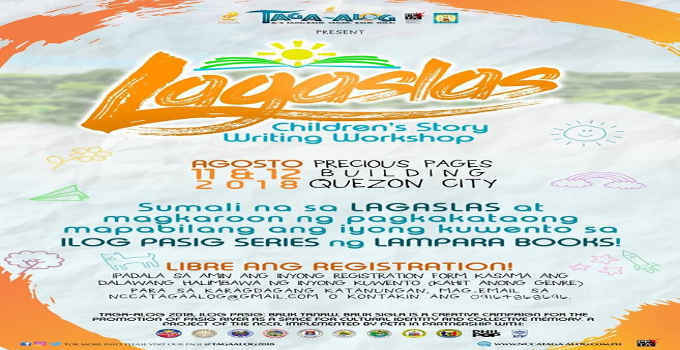 LAGASLAS Children’s Story Writing Workshop! the questions and upload an example of your story. Precious Pages Building, 16 Sto. Domingo Ave., Quezon City. [email protected] or send a text message to 09164868696.